As he should be. Diane Dietz has the report from VP for Everything Roger Thompson, on UO’s class of 2020 here. It’s mostly good news, and for once there’s no BS about how students come to UO for the winning Duck football team and our big-time sports party-school brand. And take note, freshmen. You’re the class of 2020, not 2021, so take 4 classes, not 3. 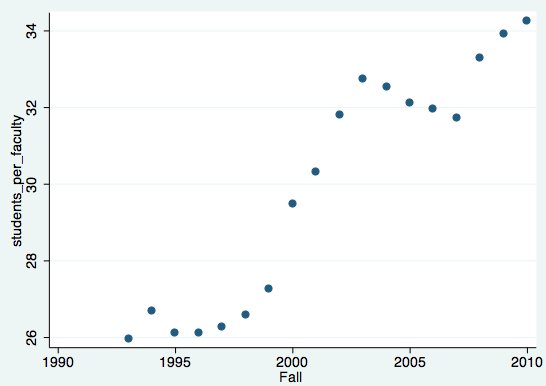 College enrollment fell 2 percent in 2012-13, the first significant decline since the 1990s, but nearly all of that drop hit for-profit and community colleges; now, signs point to 2013-14 being the year when traditional four-year, nonprofit colleges begin a contraction that will last for several years. 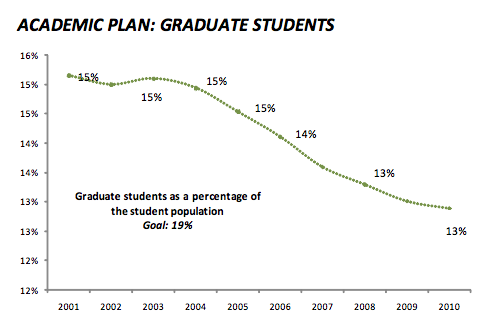 So, the worry here at UO is how we will handle this increased growth. Enrollment is already 4% above the academic plan, admissions standards are increasing, and Forbes Magazine just rated us as the 65th best college in the U.S. (Anon commenter fact-check: among public universities, that is. Overall, UO is #217, OSU is #304.) I checked their weighting scheme, it’s all about costs, student employment outcomes, and satisfaction with teaching. Football and beach volleyball count for 0%. For comparison, the AAU only paid the distinguished Dr. Bob Berdahl $550K a year. 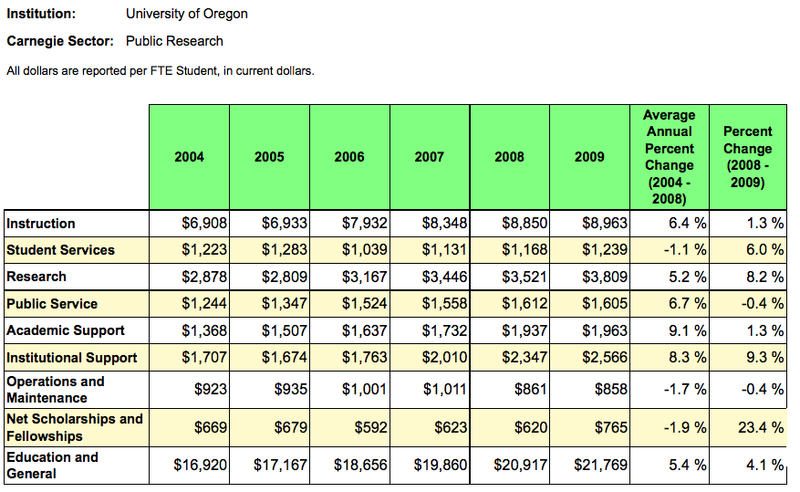 The State Higher Education Executive Officers Association is probably only paying Dr. Pernsteiner $300K or so, and the UO Foundation’s Paul Weinhold only got $340K, last time they released the data, which was a few years back. 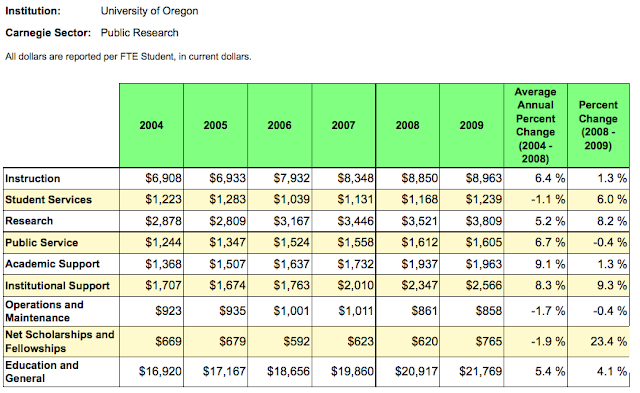 Spend a little time on guidestar.org and you will be amazed at how many higher ed “non-profits” pay salaries like these. Or wait for Carl Malamud of public.resource.org to get the IRS to release the digitized data, and for enterprising bloggers to start analyzing it. Under the terms of her resignation, the academy said Berlowitz will receive no severance, but will get a one-time $475,000 payment for retirement benefits, deferred compensation, and accrued vacation under her contract, something the office of Attorney General Martha Coakley pledged Thursday to investigate. Berlowitz will also receive supplemental health insurance for five years at a cost of no more than $3,500 a year. 9/24/2011: This graph from UO’s latest report to OUS on our “academic plan” certainly raises the question. See this earlier post for background. 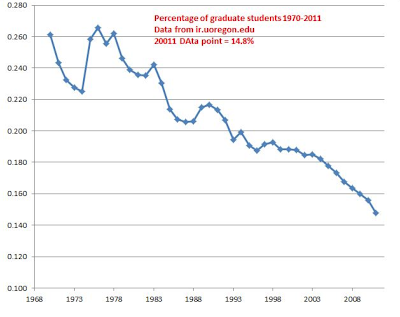 Since 2001 undergraduate enrollment has increased 36%, graduate enrollment by less than 10%, and the number of tenure track faculty by less than 10%. 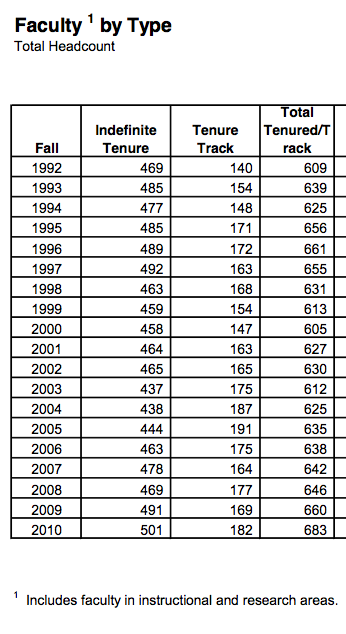 Here’s the data on the number of tenure track faculty– pretty flat with a recent small uptick. 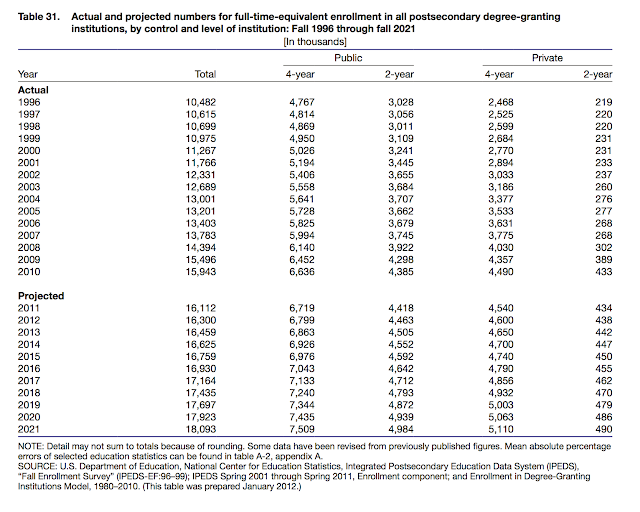 Here’s the data on enrollment. We have 24,300 this year. 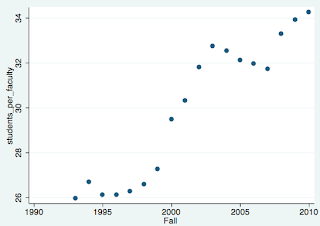 To the left is the number of students (fall enrollments) per tenure track faculty. 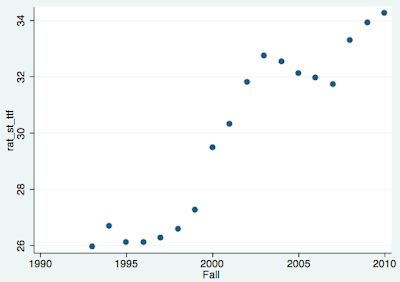 For 2011, it will be ~35. And here’s the latest IPEDS data on where the money is going, from the Delta Project. 2009 means the 2009-2010 academic year, President Lariviere’s first year in charge. 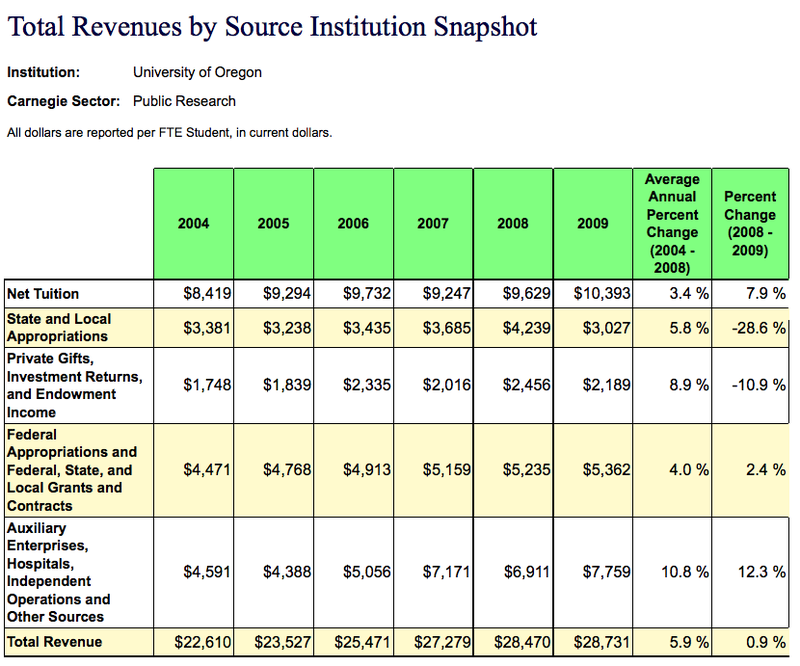 1.3% increase in instructional spending and a 9.3% increase on institutional support – meaning central administrative costs, aka Johnson Hall. From their data dictionary: “General administrative services, executive management, legal and fiscal operations, public relations and central operations for physical operation.” I wonder what the 2010-2011 data will look like? All the data from UO institutional research. It’s ugly, so Jim Bean has been counting NTTFs, which makes us look much prettier. I’ve got nothing but respect for NTTFs. 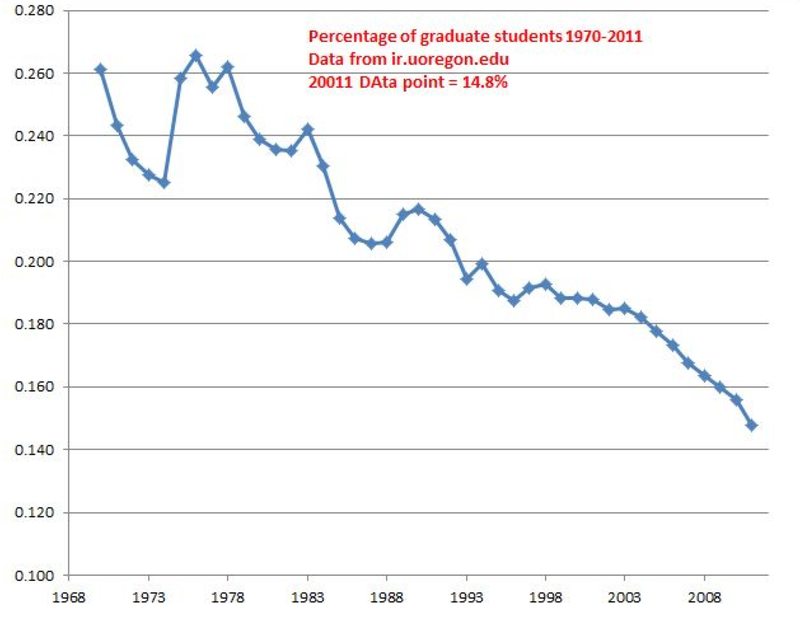 But while denial may work for US News – where UO reports a student-faculty ratio of 20 – it is probably not the way to stay in the AAU. A research university or a teaching college? Here’s the data on the number of tenure track faculty – pretty flat with a recent small uptick. 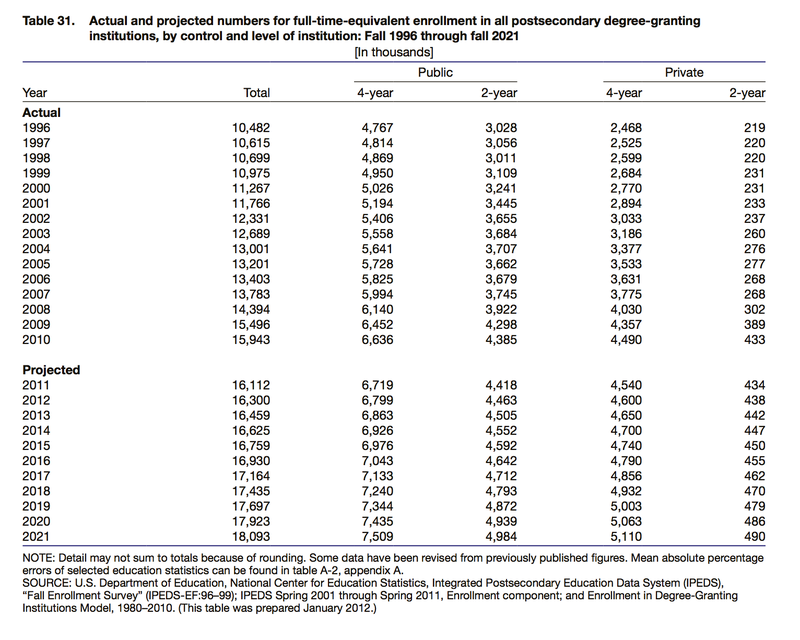 Here’s the data on enrollment. We have 24,300 this year. 8/8/2010: From Greg Bolt in the RG. If I understand it right more students than expected are coming and fewer than expected are dropping their dorm room contracts. Seems like housing is handling it much better than in 2008, when they shuffled the overflow across the river. This time they get rooms in privately owned apartment buildings near campus – very expensive rooms, however. The new dorm under construction behind Law will house 450 more students, I guess not until 2011 though. Next question, where will we teach them? I’ve had several classes with more students than desks recently. If the university can’t provide the necessary classrooms and office space either, maybe we should rent these from the private sector as well?